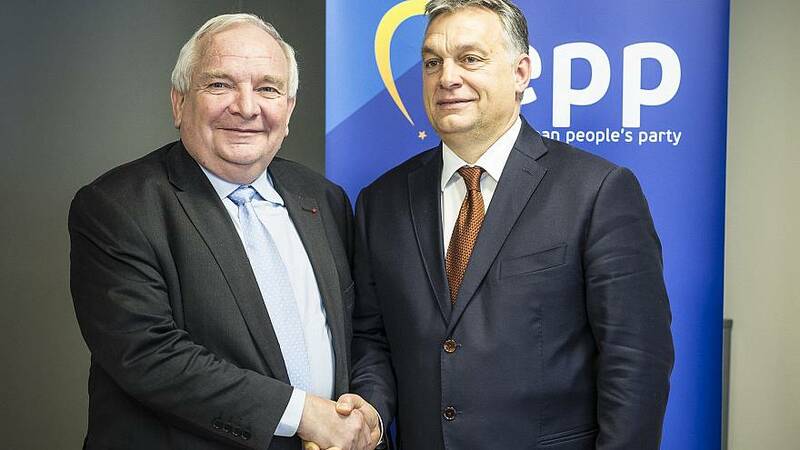 On February 22, two Swedish conservative parties wrote a letter to Joseph Daul, the President of the European People’s Party (EPP) to ask for the expulsion of Fidesz, one of Hungary's governing parties, headed by Viktor Orbán. After the move by the Swedes, 11 more European parties followed up with the same request. The last straw for most of them was the Hungarian government’s anti-Brussels campaign, claiming that the EU has a secret plan to support immigration. On the posters spreading their message they put the image of George Soros. The Hungarian-American businessman and philanthropist had been attacked in several campaigns already, accused of having a plan to flood Europe with migrants. The new element was the other man on the photo: Jean-Claude Juncker, the President of the European Commission – and a member of the EPP. The question of whether to exclude, or suspend, the membership of Fidesz (or not doing anything) is on the agenda for EPP’s meeting in Brussels this Wednesday. But isn’t the damage already done, whichever way they decide? It will be a hard task to keep the party family together. Already one member has vowed to leave if Fidesz is expelled. On the other hand, at least one party is set to leave the EPP if Fidesz stays. On each side there could be others lining up to join them. There is another option: to suspend Fidesz. This may seem a good solution to keep both sides in the EPP, but it would not last for long. It seems likely that this internal conflict will weaken the EPP, and might even lead to the birth of a new faction in the next European Parliament. A more divided EPP may confirm what the polls are suggesting already: a more divided parliament, with EU-sceptic parties set to gain more seats. This means that whatever they decide, the EPP is divided and the European Parliament will be divided too. That explains why the EPP is afraid of a Fidesz outside the party family, and some members believe the Hungarian party can be controlled inside rather than outside the fold. The risk for the EPP if it expels Fidesz is that under its top candidate Manfred Weber, it might win only a narrow majority, or lose it altogether. That would mean the party's candidate for European Commission president would need the backing of other factions like the Socialists and Democrats, the Greens, or the liberal ALDE group. All three are committed to opposing Fidesz. Will it change Europe's migration policies? Slight changes to immigration policy are possible, as the European People's Party is quite divided on the subject. Viktor Orbán claimed that immigration was the reason for the rupture in Hungarian-German political relations. Fidesz is in conflict on this with the two German parties who form a major power in the EPP: the Christian Democratic Union (CDU) and the Christian Social Union (CSU). Manfred Weber – EPP leader in the European Parliament – has set three conditions for Fidesz to fulfil if it wants to stay in the EPP. One party which agrees with these conditions is the Austrian People's Party (OVP), governing in coalition with the extreme right and hardline anti-immigration Freedom Party (FPO). Most parties in the EPP group described the latest Hungarian government campaign as the last straw, as it targeted the European Commission president. They also say that Fidesz is breaching the rule of law, and does not respect the fundamental values of the EPP and the European Union. Most of these arguments were already said during the debate in the European Parliament last September on the Sargentini report, which accused Orbán's government of posing a "systematic threat" to the EU's fundamental principles. The report was backed by two thirds of MEPs, triggering the little-used Article 7 procedure against Hungary. From the EPP 115 MEPs backed the report, and 57 voted against it (including the group's 12 Hungarians). 28 MEPs chose to abstain. It was the first time that the MEPs had decided to use the process to suspend certain rights from a member state.